BILBAO - International Airport: 100 km. - Flights to: Brussels, Dublin, Dusseldorf, Frankfurt, Lisbon, London, Madeira, Marrakech, Munich, Paris / Alicante, Barcelona, Fuerteventura, Gran Canaria, Ibiza, La Palma, Lanzarote, Madrid, Málaga, Menorca, Palma de Mallorca, Santiago de Compostela, Sevilla, Tenerife. SAN SEBASTIAN - National Airport: 20 km. - Flights to Barcelona and Madrid. BIARRITZ - International Airport: 40 km. - Flights to Bristol, Birmingham, Clermont-Ferrand, Dublin, Helsinki, Geneve, London, Lyon, Nice, Paris, Shannon. PAMPLONA - National Airport: 90 km. - Flights to: Lisbon, Barcelona and Madrid. Travel instructions dependant on Spanish arrival airport. N.B. (all town names in the Basque Country are in Basque and Spanish, so Donostia- San Sebastian is the same place). There is a bus every hour from the airport; it is easy to get to as it is located right outside the airport arrivals doors where you would naturally exit the airport. The price will be around 10 Euros and the duration of this travel is one hour and ten minutes. The bus drops you at the bus station in San Sebastian which will be less than a 10 minute car journey to the Costa Vasca hotel if this is where you intend to stay or a similar time to the hotel of your choice. (A ten minute journey is approx 8 Euros in a Taxi). You can also take the option to take a further bus from the same place instead of a taxi. You would need bus number 28 direction 'Down' - this should take between 7 - 10 minutes. Please be aware that this bus has two different routes, one is going to 'Miramon' and the other is going 'Downtown', it is a circular service, but taking the one that specifies it is going 'Downtown' will save you 30 minutes (it is on the same sidewalk as the bus station, do not cross the street). When you arrive 'Downtown' you can get bus number 25 or 5 (this part of the city is called 'Boulevard' and all the buses are there every 5 minutes approx.) Taking Bus 5 or 25 will take you to 'Ondarreta Beach', that trip should take 10 minutes or so, and then you will be walking distance to the 'Costa Vasca Hotel'. Buses are around 1.8 Euros each, so if you happen to be travelling as two or more persons, the taxi is a better option. This city is pretty small, you are at a walking distance everywhere, but not knowing the place the best chance is taxis (quite expensive as people barely use them). On arrival here as you can get a bus from this airport that will take you to Donostia-San Sebastian in 20 minutes, however this airport is quite small, expensive and only planes from and to Barcelona or Madrid will arrive here. From San-Sebastian bus station follow the same as above - Taxi 8 Euro or Bus 1.8 Euro. Another option is to arrive into Biarritz (France); this is a popular option which is 35 minutes, you get the TVG to 'Hendaye' and from here you get the local train (call 'Topo' or 'Euskotren') the station is right next to the building. Then in 30 minutes from 'Hendaye' you will be at 'Amara Train Station', from there you can get to the boulevard walking and take Bus 5 or 25 to the 'Costa Vasca', also taxis are available there. 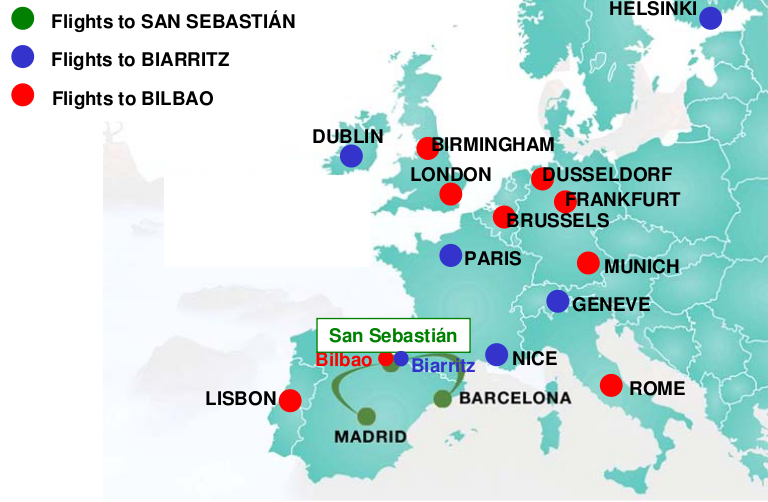 It has been recommended in the past that the easiest way is to fly into Bilbao, taking the bus from here to San Sebastian and then taking a cab to the hotel of your choice. This option will be 20 Euros or less from the airport front door to the hotel. You can also get a taxi in Bilbao straight through to your chosen hotel, but it will be around 110 Euros, so we wouldn't recommend that option unless you arrive late at night and no buses are available. (The last bus departs approximately around 22:30).